Durad was born on the Primary Bolian home world. He grew up enjoying shellfish, and water wrestling and had a rather normal Bolian youth. He wasn't the best or the brightest, but he always managed to keep his grades up. For most of his youth, he was a last minute kind of guy... choosing to skip through the hot afternoons with a bowl of human watermelon and a holo-game. When he reached the age to enter the academy, he chose to enlist rather than stress himself over trying for officer placement exams. He earned the respect of his parents, whom had little to do with the Academy either. He made them proud, and they always referred to him as being a cadet, as he still studied at the academy, but it was a two year program. When he got to his first assignment he, quickly was worked in to the shift rotation. 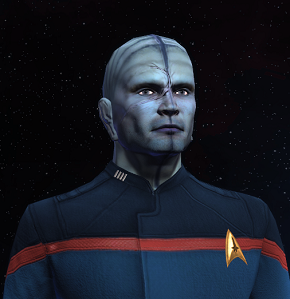 Soon he was paired with a young Ensign, Arcos Darye. The two worked together to solve a contagion crisis transmitted through a Ketracell white modified substance. Although, Success did not grant him the glamour, after the Warrior was decommissioned he was offered a referral from then, commander, Arcos Darye to return to school. This page was last edited on 1 December 2013, at 05:58.